Last weekend was Popkomm weekend in Berlin and we had all sorts of nice bands and concerts around. Benny Sings played at the Apollo Soul festival, presented by Sonar Kollektiv. When I was 19, I played in two bands with their drummer Tim Dudek and I am really proud that he has become such a succesful musician. As well he is with the band “Outernationals”. 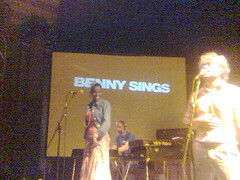 Benny Sings is something in between Jamiroquai and D’Angelo, I enjoyed a soulful concert that put the audience in a dancing mood. I love Benny Sings and now I am the proud owner of a 12″ signed by all members (except the keyboarder Andy, where were you?!). Enjoy a video, I am sorry, mobile phone quality, next time I’ll bring a better camera.